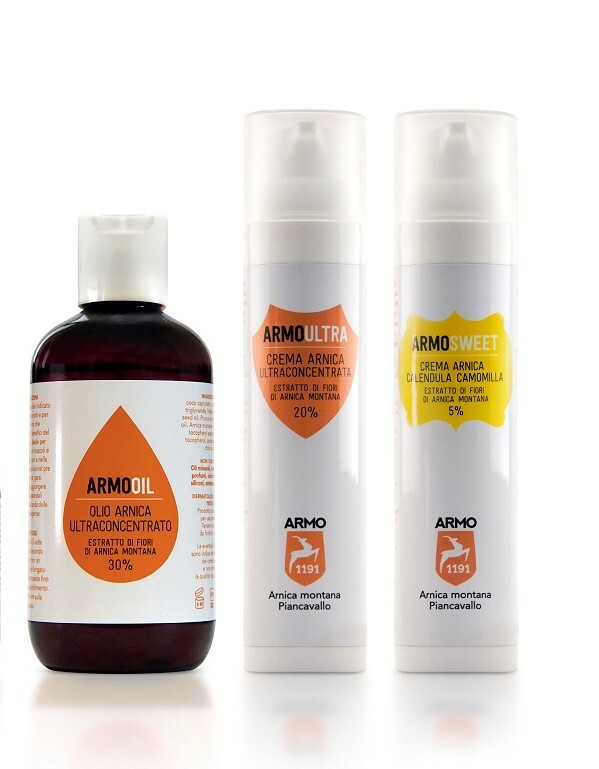 Set with ArmoOil, ArmoUltra and ArmoSweet with Arnica montana. The products are especially indicated for sport purposes before and after playing, for pains treatment, preventing infection and for being antirheumatic and for sensitive skins like those of the children. Bottle 200 ml, two dispenser of 100 ml. 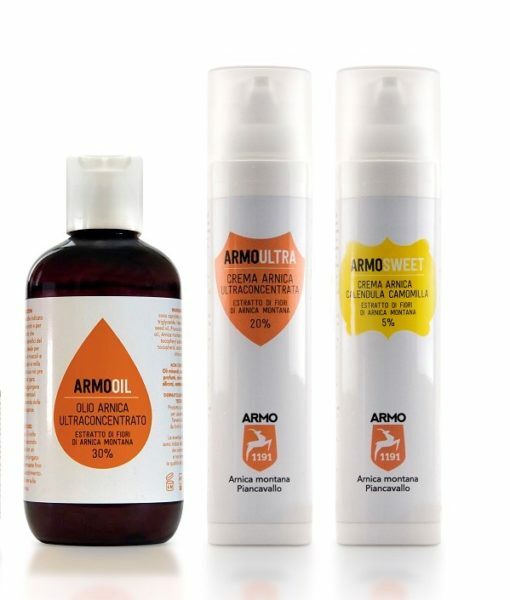 Arnica Armo1191 Set with ArmoOil 200 ml, ArmoUltra ed ArmoSweet, for the whole family. ArmoOil is a cosmetic oil based on Arnica montana flowers essence and enriched by Almond oil and Vitamin E. With the Arnica montana’s high concentration of 30%, the product is particularly indicated for relieving bruising and muscle pains. 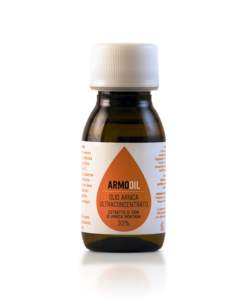 ArmoOil is especially indicated for professional masseurs and for everyone who appreciates massage benefits. The products is also recommended before and after playing sports for smoothing away muscle aches, leaving the skin refreshed and rejuvenated. Apply locally to affected area with a prolonged massage until completely absorbed. Repeat the operation 2-3 times per day or when necessary. For sport purpose: get ready your body massaging energetically the muscles, after sport repeat the operation kindly but with a prolonged massage. Do not apply on skin pains. ArmoUltra cream is a cosmetic with high concentration of Arnica montana flowers and enriched by Peppermint. With an Arnica’s concentration of 20%, especially indicated for pains treatment, preventing infection and for being antirheumatic. Apply a thin layer of ArmoUltra cream to affected area and massage gently until completely absorbed. 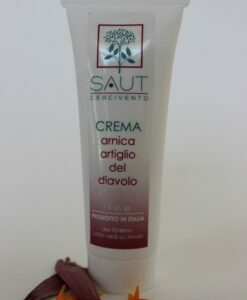 ArmoUltra cream is also useful in symptomatic treatment of hematomas, arthritis, injuries, inflammations of the oral mucosa, scars, acne, for irritated insect bites. ArmoSweet cream is a special cosmetic with a 5% concentration of Arnica montana flowers and enriched by Chamomile, Marigold, Vitamin E and Pantothenic acid. The product is particularly indicated for sensitive skins like those of children. 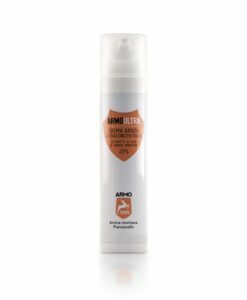 ArmoBaby cream is indicated for preventing flushed skin, skin irritations and chaps during Winter and Summer seasons. Arnica cream is also useful for irritated insect bites and in the symptomatic treatment of hematomas. Apply on face or body and massage gently until completely absorbed. The airless dispenser bottle protects the natural product and riduces any waste. 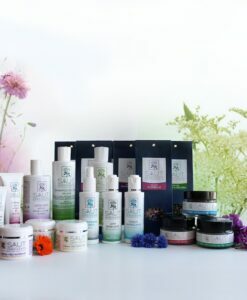 ARMO1191 products do not contain parabens, phenoxyethanol, silicons, paraffins, PEG, colorants, BHA, BHT, parfums, SLES, SLS, EDTA, ethyl alcohol, animal ingredients. Ingredients ArmoOil: coco caprylate, Helianthus annuus seed oil, caprylic/capric triglyceride, Prunus amygdalus dulcis oil, Arnica montana flower extract 30%, tocopheryl acetate, lecithin, tocopherol, ascorbyl palmitate, citric acid. Ingredients ArmoUltra: aqua, Helianthus annuus seed oil, polyglyceryl-3 dicitrate/stearate, cetearyl alcohol, glycerin, glyceryl stearate, Mentha piperita herb oil, Arnica montana flower extract 20%, tocopheryl acetate, xanthan gum, sodium phytate, benzyl alcohol, dehydroacetic acid, lecithin, tocopherol, sodium hydroxide, ascorbyl palmitate, citric acid, limonene. 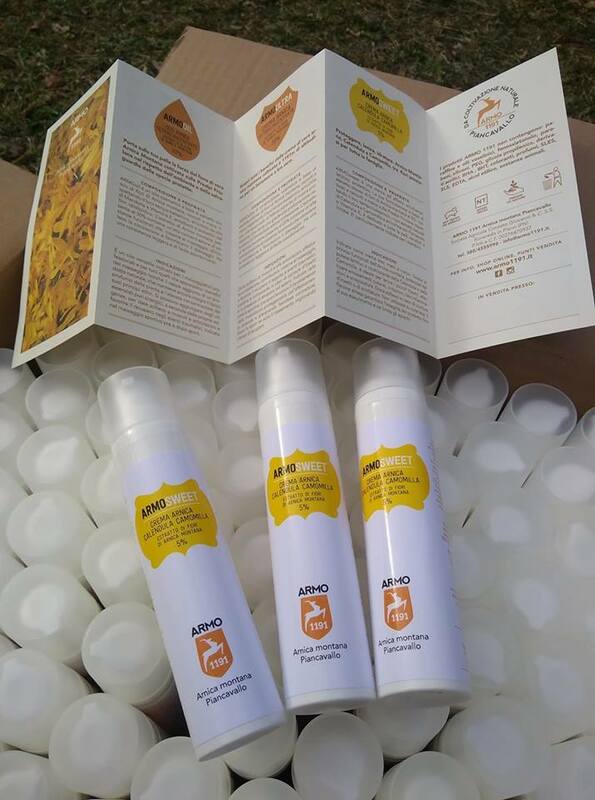 Ingredients ArmoSweet: aqua, coco caprylate, caprylic/capric triglyceride, Helianthus annuus seed oil, polyglyceryl-3 dicitrate/stearate, cetearyl alcohol, glycerin, glyceryl stearate, panthenol, tocopheryl acetate, Arnica montana flower extract 5%, Calendula officinalis flower extract, Chamomilla recutita (matricaria) flower extract, xanthan gum, sodium phytate, benzyl alcohol, dehydroacetic acid, lecithin, tocopherol, sodium hydroxide, ascorbyl palmitate, citric acid. 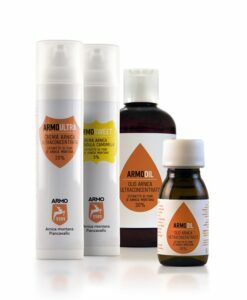 ARMO is an acronym which means ARnica MOntana. 1191 it is the altitude (expressed in meters) at which Farm Conzato grows Arnica on Piancavallo tableland (Alpine mountains in Friuli Venezia Giulia, Italy). 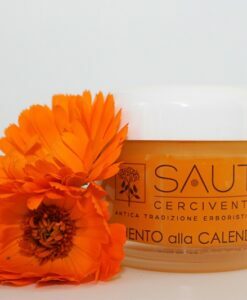 Conzato Family, who has been developing in the area around Pordenone town (Italy) grapes cultivation since mid of 20th century, has recently resumed an ancient tradition with an organized and innovative cultivation of Arnica montana. 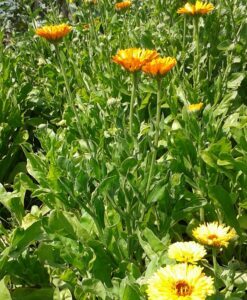 The plants are cultivated in little parcels distant one from the another, using only natural fertilizers. The harvest of fresh flowers is manually carried out in the optimum time, then flowers are naturally dried; active ingredients are naturally extracted by maceration in sunflowers oil. Arnica montana is a perennial plant and a protected specie of the mountain area growing in acid soils up to 1000 m. This plant has been used since ancient times by people from the Alpine mountains for its important properties. The root contains essential oils which are powerful anti–inflammatory agents.